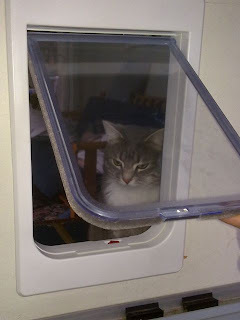 Training the cats to use the windoor has been quite the challenge. With the cold weather we have beenb having, I can certainly see how using such a door will save us a lot of money on heat! Although, the future of being able to utilize the door is uncertain. For the most part, Theo has figured it out. He's still a little apprehensive about mashing his head against the clear plastic door, but he makes it happen, especially for treats! I haven't seen him carelessly travel through it without him stopping and thinking about it first. And even when he thinks about it he wants to use his paw to somehow open the door. Willow has not been willing to touch any part of herself against the lexan door. She will pass through it only if it is propped open. I tried will all sorts of yummy treats right before dinner to lure her to touch it but she refuses to touch any part of it! 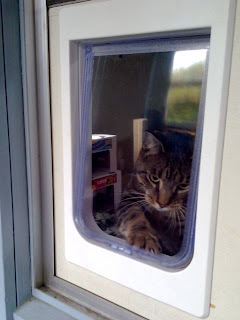 Nahum, is similar to Willow, only I have a hard time getting him even interested in thinking about the windoor. He has never been a huge fan of spending time on the porch, so his motivation to get out there is slim.